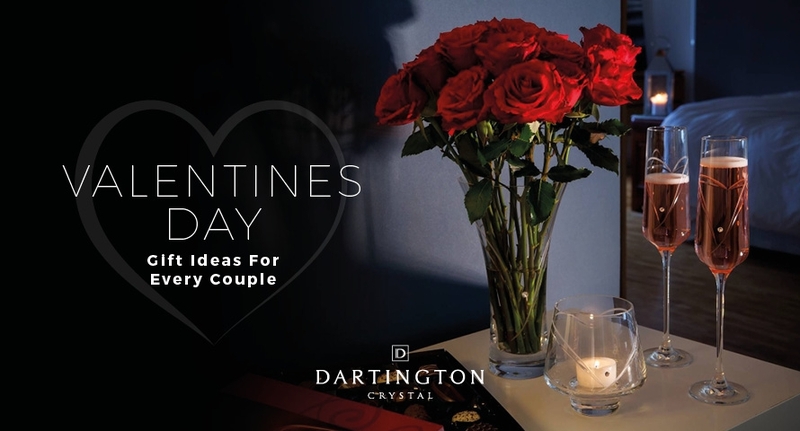 Valentine’s Day, a celebration of romance across the UK and most certainly a celebrated day here at Dartington Crystal. Whether you’re one half of a married couple or about to go on a first date, we’ve got ideas to help make this day extra special, no matter where you are on the journey of love. First date nerves may get you flustered, but one thing that’s sure to put a smile on their face is a Valentine’s gift to mark the occasion. The Special Moments Ruby Heart is a beautiful memento that will create a wonderful first impression and a gift they can treasure forever. If you prefer something to help break the ice, then keep things fun and relaxed by making Valentine’s cocktails together. There are plenty of easy recipes available and paired with the perfect cocktail glass, it’s a sure fire way to impress and put you both at ease. Searching for the perfect way to pop the question? Our glassware engraved with a personalised message is a gorgeous way to express your words (especially if you’re worried nerves may get the best of you!) Want to say it another way? Then recreate a beloved moment with our 3D photos blocks and surprise your loved one by adding an engraving of that all important question. Finally, make the most of this momentous occasion and celebrate your recent engagement in style with a bottle of fizz paired with the perfect celebratory glass like our Romance Champagne Flutes. For those of you now settled down with a long-term partner, Valentine’s Day is the perfect chance to show just how much you cherish and appreciate them. Nothing says ‘I love you’ quite like a home cooked meal with their favourite tipple. Use candles to create a warm, romantic atmosphere and make sure any flowers are out on display in a gorgeous vase for a perfect finishing touch. Want to make it extra special? We’re offering FREE TEXT ENGRAVING until Valentine’s Day if you wish to personalise an item with your own message. If you’re looking for even more Valentine’s Day gift inspiration, then head over to our specially curated Gifts for Valentine’s section. We’d also love to see your Dartington gifts this Valentine’s, so feel free to share your special day and tag us on Instagram.